Grisaille watercolor sketch of a deserted town street with ramshackle buildings. The sketch is titled "Deserted Kansas Town" and was executed by Jules Tavernier. Tavernier was born in Paris in 1844 and trained as an artist in France. He served as a soldier in the Franco-Prussian War, and his drawings of war-torn Paris were flown by hot air balloon to London for publication. After the war he worked as an illustrator in London and then in New York for Harper's Weekly. In 1872, Harper's sent him on a trip across the United States on an assignment to document the American West. He arrived in San Francisco in 1874. 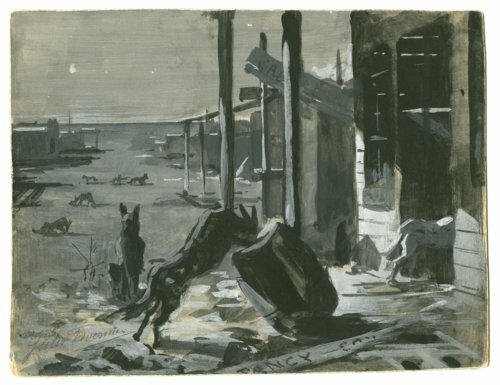 This sketch is most likely a scene that Tavernier saw while in Kansas on that trip. Tavernier went on to be a well-known artist in California before moving to Hawaii, where he was part of a group of artists known as the Volcano School. He died in Honolulu in 1889.